=> Networking training in PDX area, + Mastermind meeting + PDX seminar + more! Video is fast becoming the preferred form of internet communication, and if you're not posting high quality video content, you're going to miss out on more opportunities every day! Before the seminar, you can Mastermind with your marketing coach and your peers from 3:30-5:30 PM in the Community Room at Lloyd Center. This will be our penultimate event in Portland in Q4, so please do join us for a fun and productive meeting. Finally, a Networking Training in the Portland area! So you're going to meetings, but not much is happening. Sure, you meet some nice people and you're comfortable being there, but new business? Not so much. DIY Marketing Center Weekly Member Update © 2017 Veronika Noize. All rights reserved. Are You Ready to Plan for Profits? I've dedicated an entire year to helping YOU achieve your goals with the Prosperity & Profitability series, and I'm not done yet! The final meetings happen this week. Do you want more for your business? Hey gang, due to low attendance, the October Mastermind meeting and marketing seminar at the Lloyd Center location will be the last meetings in Portland this year. The Mastermind meetings and marketing seminars will continue at the DIY in Vancouver in both November and December on the third Fridays as usual. => 5 Facts about Group Marketing Coaching and more! So this was already sent by mistake last week. Oh well, now it's the right time. I just discovered that some of you didn't know these fun facts about our monthly Marketing Coaching Calls. Let the enlightenment begin! Marketing Coaching Calls give EACH participating member up to 8 full minutes of 1:1 coaching time with me, your marketing coach. There are two hours of the call, and you register for the hour you wish to attend. Example from this week: Marketing Coaching 2 (meaning the second session of the month) starts at 10 AM. Marketing Coaching 2.5 is the second hour of that call, and starts at 11 AM. You register for the hour you wish to work with me. The room key for iMeet (our virtual meeting room/webinar platform) is the SAME for both hours. So you can attend both if you wish, getting the benefit of the other participants' work by listening to their sessions. You are guaranteed time with me only in the hour for which you register. You may attend both hours if you wish. All members may participate in Marketing Coaching Calls. Marketing Coaching Calls are included in All Access passes, but any member can attend for a small fee. What's this--a bonus fact? Yes! Audios and videos of the most recent calls are posted on the Marketing Coaching Calls page, and are available to all members. So if you missed something, or are curious, you can always see/hear the latest call. All you need to do is ask (send me an email, OK? ), and let me know where to get a good quality photo of you. Hint: Often, there is one on Facebook that I can use. Then I write up the copy, send you a proof for your review, and put you on the schedule. Easy peasy. Our monthly marketing class happens the second Wednesday (as a webinar) and the third Friday (as a seminar in Vancouver), and this month they're in the same week. 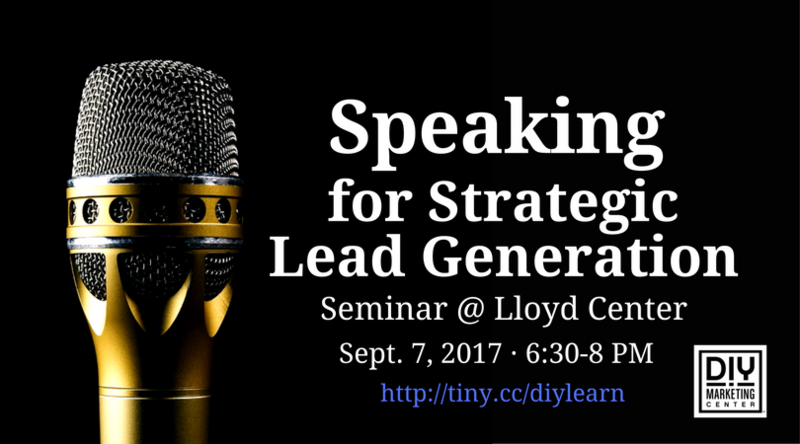 The handouts are already posted for you on the Speaking Lead Gen page in the Marketing Classes area of the Members Only part of the DIY website. Introducing 1:1 Orientation Calls for Members! Are you getting the most out of your membership? Do you have questions, but never get around to asking them? Introducing private 1:1 member orientations, tailored for your needs and schedule! Every member gets one private orientation session on the house. Schedule your orientation when it's convenient for you on the Member Coaching page. => Short but busy week at the DIY! Are You Ready to Earn More by Speaking Your Truth? 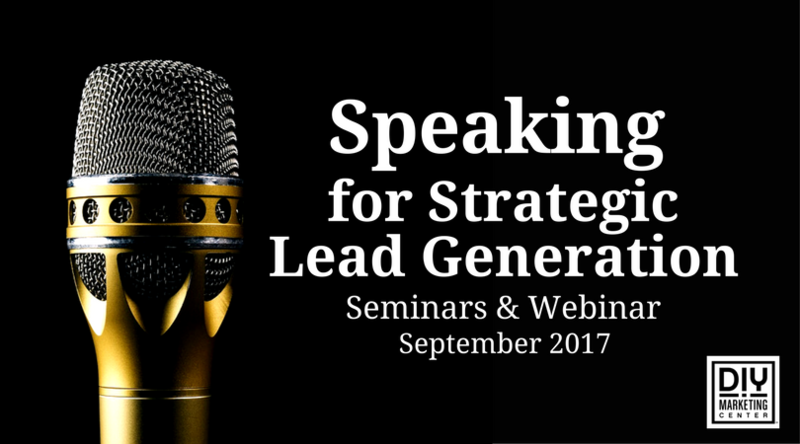 Can you really attract more clients, boost your revenue, and become a little bit famous by sharing your message? YEAH BABY! And I will show you how. Your first chance to catch this class is this week on Thursday at 6:30 PM in our training room at Lloyd Center. Hope you can make it! DIYers, learn both of my super powerful networking strategies at this class on Friday, September 8 from 9:30-11:30 AM at the DIY in Vancouver. You are on the guest list; just use the code REDACTED on the Guest List option.